Why dont you tell your friends about jesus4usall? Clicking the, Email a friend, link below will open your Mail Client, e.g. Outlook Express, yahoo, hotmail, etc. Example, email to send to your friends and contacts, just copy and paste into your email. 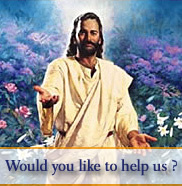 Hi I thought you might be interested in this new web-site called jesus4usall.com, just click on one of the following links to get you there. Hope you find it interesting, they have some good books there and if you need prayers for anything they can pray for you, it's Free! Why not take a look and also pass this information on to your friends? Thank you, hope you like it and find it useful.